After catching up with a friends for very interesting and slightly addictive drinks at this newly opened venue, I decided that a return visit was required and completely justified as it's so close to work. Seeing that it wasn't really appropriate to return for hard-hitting drinks on a workday however, a lunch visit was decided upon instead. 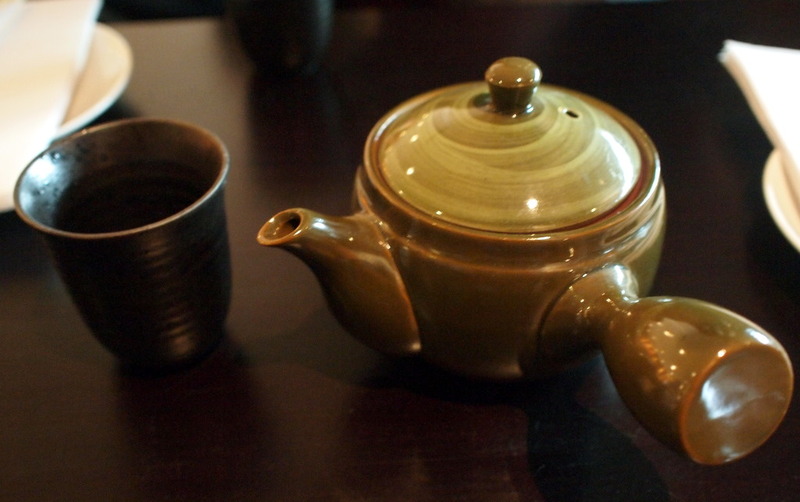 A few pots of tea from their extensive tea list accompanied by a plate of Edamane Beans temporarily sated out appetite while we waited for our food to arrive. 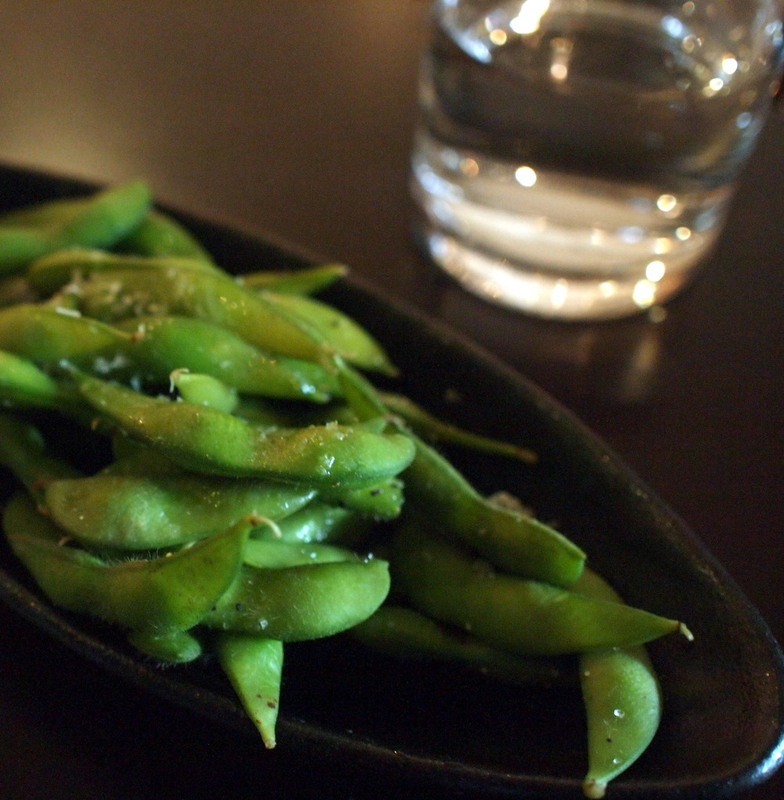 The beans were lightly salted, with just the tiniest bit of oil making them addictive. I could probably convince myself that these were 'healthy' snacks, but in hindsight, the amount I consumed meant that I certainly ingested more salt than was good for my body. Who can argue with such deliciousness though! When our mains arrived, we quickly realised that the bento boxes were high quality and definitely good value for money at less than $20 each. Coming with a generous serve of rice, miso soup, pickles, Pocket Salad and two oyster filled spring rolls, there were salmon, chicken, beef, tempura and vegetarian options on offer. You read that right. Oyster filled spring rolls. Fresh oysters wrapped in crispy pastry topped with wasabi mayo and tobiko (flying fish roe). Even my seafood-hating dining companion loved them. Soft and juicy with just the slightest bit of crunch coming from the spring roll shells, the small taste left you wanting more. 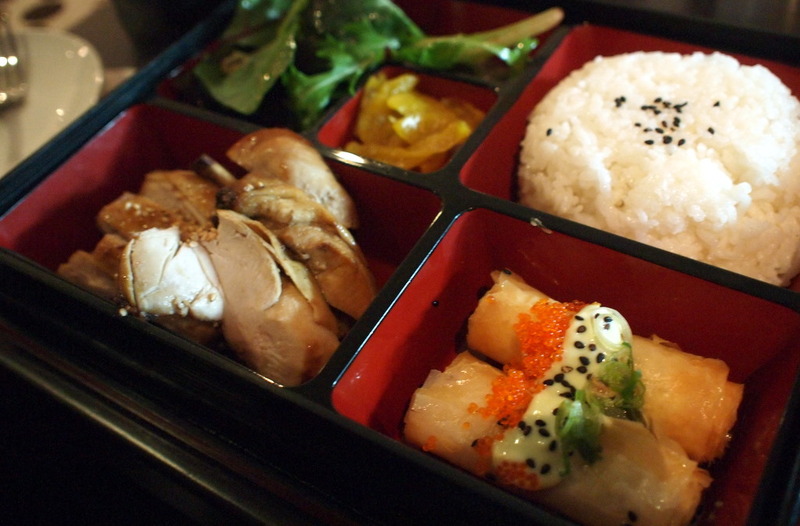 I should move on to the actual feature dish of the bento boxes, however. 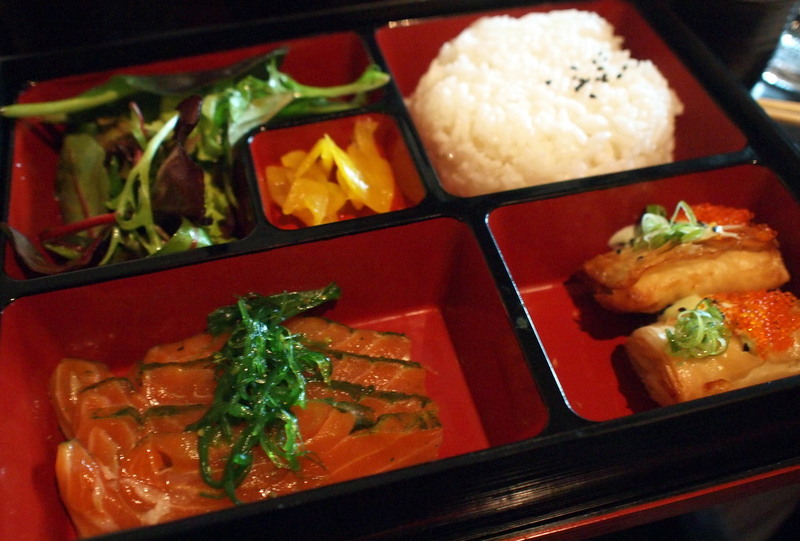 I ordered the Tea Cured Salmon Bento. Most places I've been to serve plain salmon sashimi in the bento boxes, but the extra effort involved in tea curing the fish really makes a difference. There wasn't any 'fishy' taste or smell (which can sometimes be off-putting), instead, just delicate, melt-in-your-mouth salmon that had just a hint of smokiness. I guess it'll be hard for me to go back to regular sashimi after trying this. 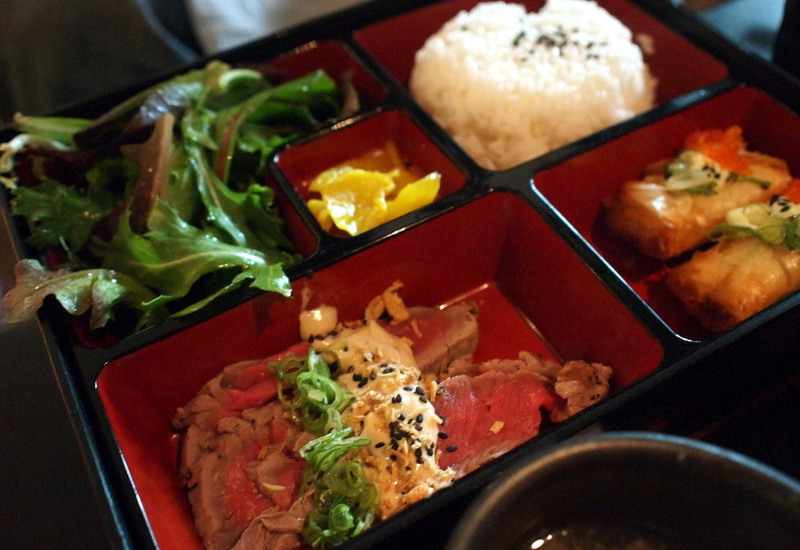 One of my companions was craving meat, and so ordered the beef teriyaki bento. The beef was very lightly cooked. If you tend to have your steaks well-done (why? ), I wouldn't recommend this dish to you. If you're like me though and like your meat medium rare to rare, they've done this almost perfectly. Finely sliced and tender, this was a second giant tick of approval for the bento boxes. My remaining companion, being both non-beef eating and non-seafood liking ordered the chicken teriyaki bento. I liked the chicken a little less, but perhaps that was just as a result of the other two being so brilliant, and my tendency to find chicken a little flavourless. My companion enjoyed it immensely though, so I guess that's a third tick. We were actually meant to get another dish as part of the promotion they were running, but seeing as we forgot to order it, it's no wonder that we didn't end up getting it. We were pretty full after eating the bento boxes, so perhaps it was a good thing that we left sated, but not full to bursting. 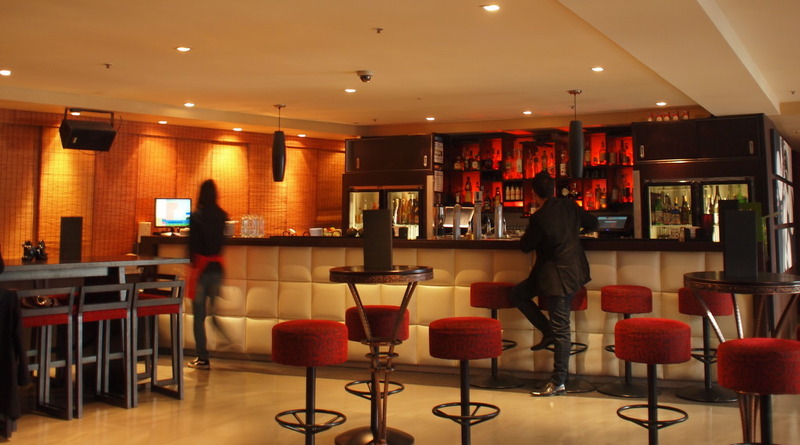 The service was fast and friendly, and the venue is a nice and quiet retreat from the business of the CBD. I don't think this place will stay hidden for long though, it's too good not to become popular.